This Meyer lemon marmalade–made with just three ingredients: lemons, sugar, and water–is a sensational spread for breakfast, brunch, or a surreptitious snack. 1. Scrub the lemons and trim the ends. Cut 4 lemons into eighths lengthwise (yes, peel and pith and all), remove the seeds, and cut each length crosswise into very thin slices. Set aside. 2. Trim the peel and pith from 2 of the remaining lemons. Hold the peeled lemons over a small bowl and cut the segments free from the membranes, allowing the segments and juice to fall into the bowl and discarding the membranes, peel, and pith. 3. Juice the remaining lemon (you should have about 1/4 cup juice). 4. Bring a small pot of water to a boil over medium-high heat. Add the sliced lemons, return to a boil, and cook to remove some of the bitterness, 2 to 3 minutes. Drain, pat dry, and set aside. 5. In a small saucepan, bring the cold water, sugar, and the 1/4 cup lemon juice to a boil over medium-high heat, stirring until the sugar dissolves, 2 to 3 minutes. Add the sliced lemons and the lemon segments and return to a boil. Reduce the heat to low, skim any foam from the surface, and simmer very gently until the mixture breaks down and thickens, 40 to 60 minutes, checking frequently to prevent scorching or overcooking. 6. To test for doneness, chill a small dish in the refrigerator. Drop a small dollop of marmalade on the dish, let it cool briefly, and then run your finger through it. If the mark remains, the marmalade is ready; if it doesn’t, cook the mixture for a few more minutes and retest. Cool completely, cover, and refrigerate for up to 2 weeks. I LOVE this Meyer lemon marmalade. The preparation is somewhat tedious and a bit messy but the end result is really quite stunning. It took me almost 45 minutes to prepare the lemons and another 45 to 50 minutes for simmering on the stove. The marmalade isn’t only beautiful, it has an amazing lemon flavor. I’ll most certainly use this recipe for the special people in my life. It’s sometimes the more subtle things in life that truly impact our perceptions and experiences. This simple but decadent Meyer lemon marmalade took me back immediately to dining experiences on the Amalfi Coast and, interestingly, in Normandy, France. 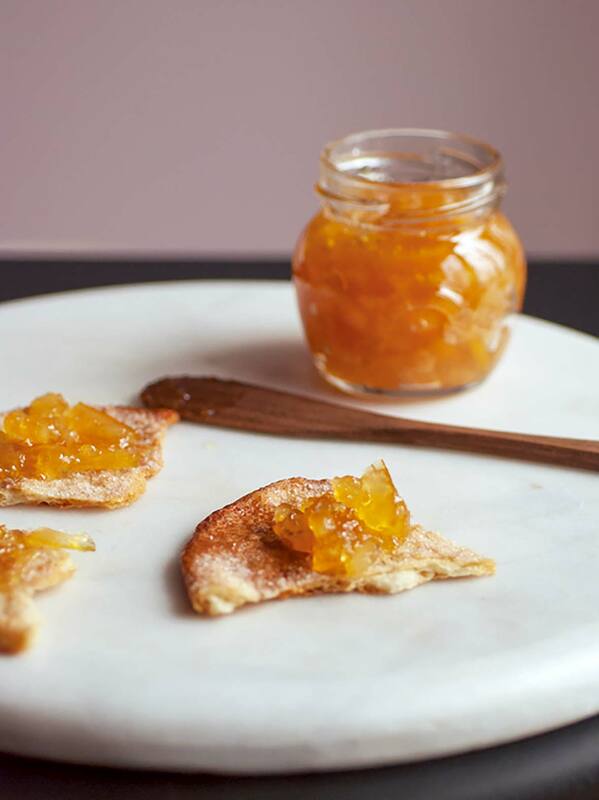 Simple to prepare and extremely forgiving, this recipe delivers marmalade to devour! I’ve visions of this marmalade on a variety of breads, paired with other ingredients too, if desired: sprigs of mint, a drizzle of honey, a couple of fresh berries to name a few. With a tight schedule today, I set up my mise en place ahead of time so that I could stir and observe the marmalade during the cooking process. Unexpectedly my son’s event ended early, when the marmalade was just beginning to thicken. I’d no choice but to turn off the heat, put a lid on the saucepan, and pick up my son. Fifty minutes later I finished the cooking, and voila—the marmalade is superb. I used 7 large lemons, which added up to about 2 1/3 pounds (along with the stated 1 cup of water and 2 cups of sugar), and yielded almost double the 1 1/2 cups stated. I wasn’t sure what the definition of “thin” was in step 1. I guessed <1/4 inch. Might be helpful to know if the sliced lemons should be as thin as possible or perhaps a 1/8-1/4-inch thickness. I assumed in step 5 that I should simmer the mixture in an uncovered saucepan to prevent steaming/condensation during cooking. The test for doneness was worded well. I’ve two Meyer lemon trees in the backyard, with plenty of fruit still on them, so this was the perfect recipe to try out. The outcome exceeded my expectations. Think yellow-colored orange marmalade, just a tiny bit more bitter. I tried it on bread with cottage cheese—just blew my mind. 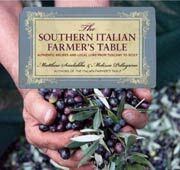 The recipe is very well written; the hands-on and cooking times are pretty accurate. Yield is 2 cups instead of the stated 1 1/2 cups. I had to adjust the cooking time a little bit to 70 minutes instead of the stated 40 to 60 minutes. I removed some of the white pith running inside the lemons when I cut them into slices, which wasn’t noted in the recipe. The only thing not absolutely clear was the appropriate thickness of the slices; it stated “thin.” I cut the lemons into 2-millimeter slices, which worked very well for me. All things considered, a nice recipe very worth the labor and time. This marmalade isn’t just unique, it’s delicious. The preparation is a bit time-consuming, but it’s worth the time. I halved the recipe because I purchased only 1 pound of lemons (which I now really regret.) I divided the lemon prep in proportion to the full recipe. The stated yield was correct, about 3/4 cup for the halved recipe. I also adjusted the cooking time. One way to speed up the prep, if you have a good chef’s knife, is to line up three 1/8 slices of the lemons side by side and cut them crosswise into thin slices all at once. Beats doing them one by one. It’s very important to carefully watch the simmering mixture, as it can easily scorch or overcook, as the author points out. If the marmalade thickens too much after it cools, a little water or a little more lemon juice and a few seconds in the microwave will help get it to a nice, spreadable consistency. This marmalade was delicious on buttered toast with some slices of sharp Cheddar cheese. Meyer Lemon Marmalade Recipe © 2012 Matthew Scialabba | Melissa Pellegrino. Photo © 2012 Matthew Scialabba | Melissa Pellegrino. All rights reserved. All recipes and photos used with permission of the publisher. This sounds like a great way to preserve some of the last Meyer lemons! Thanks for sharing. So true Laura, one of the reasons we had to get this recipe out is because the season for these gems is almost gone. I ruined an entire batch of etrog (citron) marmalade by not discarding the first boil and therefore keeping the horrible bitterness of the pith in the final product. Your instructions of boiling for a few minutes and discarding this first boil liquid is so important. Stu, many, many thanks for underscoring the essential-ness of that aspect of the recipe. Greatly appreciate it…. Is there a way to preserve this to last longer than 2 weeks? Hi Arlene, most state extension offices have instructions on water bath and pressure canning for longer preservation times. I usually look to http://nchfp.uga.edu/publications/publications_usda.html for canning advice. I loved this recipe, it turned out fabulous! The only thing I did differently was before boiling the peel for about 3 minutes to reduce bitterness, I separated the juicy flesh from the rind. I just couldn’t fathom boiling away all the wonderful flavor during that step. So I used my sharp little paring knife and traced the flesh from the rind of the half moons of lemon. It turned out wonderful. I just added the extra flesh to the bowl of segmented fruit, along with any juice that escaped while working with them. A flexible plastic cutting board was ideal for this step. I’ll use this recipe again and again. Thanks for sharing it. Oscar, so glad you like it. The only difference by adding the extra flesh uncooked is the marmalade will be a bit more bitter, but if that doesn’t bother you, you’re all set. The Meyer Lemon Marmalade is simply exquisite. It’s a spoonful of sunshine. Tart, citrus-y, sweet, sticky, a little chewy and that wild mandarin/lemon flavor. Unlike anything I’ve preserved before. Followed the recipe and did not find the bitterness to be off-putting. 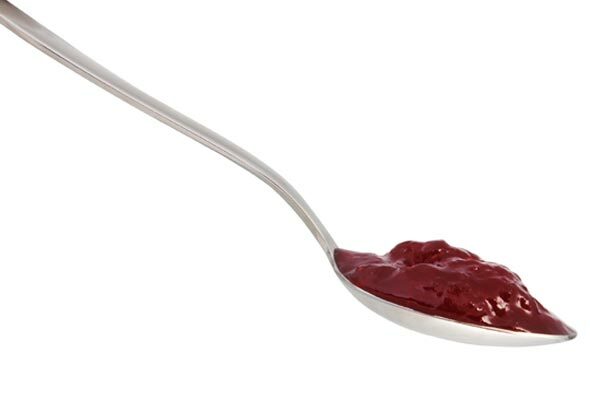 It’s very minimal and gives the preserves a little extra bite. You’re so very welcome, Susanne! And thank you for taking the time to share your thoughts and this stunning photograph! Love your presentation. Gorgeous! I’ve made this meyer lemon marmalade every year, scaled down by half since it’s only the 2 of us. The discard of the first boil is SO important. I had used another recipe, one that didn’t have this step and we couldn’t eat it. It was extremely bitter and I had to throw it out, which was really painful. Then I tried this recipe, to the letter. I, too, was worried about losing all that flavor in the first boil but that was not the case. 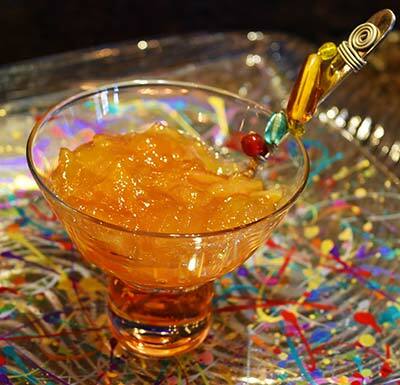 The marmalade had a wonderfully bright flavor and a mild bitterness that complemented the lemon flavor. The meyer lemon fragrant was still intact. It was and still is wonderful. Try adding a vanilla bean (it’s divine in this marmalade). AnnieN, thanks for following the instructions. We have more than 150 recipes testers, and we have so many to make sure we make the mistakes, not you. And it hurts us when a reader misses an important step, such as tossing the first boil, and wastes food. How easy is it to double or triple this recipe? Jade, we didn’t test it that way, so we can’t say for sure. Cooking jams and marmalades requires precision. My suggestion is to make several single batches. That way you know the amounts, the timing, and procedure. Having said that, please look at the review of one of our testers Sue Davies. She said she had almost a double yield. This is such a wonderful recipe. The marmalade is a lovely clear, golden color. Slightly sticky, not too sweet or too tart – just perfect. I had 2 pounds of small lemons – about 12 – and it yielded about 3 1/2 cups of marmalade. You’re so very welcome, Mary! Glad you love this marmalade as much as we do! Thank you so much for taking the time to let us know! I had 1 pound of Meyer lemons in the fridge and an impending visit to my marmalade-loving dad. Figured I’d throw a half recipe of this together and hope for the best, though I’ve never had great success with marmalade making. Much to my delight, this turned out great. The half recipe made one half-pint jar. Will be making a full batch next time! ariadne, I would add it in step 5, but make sure to wrap the thyme in cheesecloth so that you don’t have fish through the mixture to pick out the leaves and stems. And you don’t want to can the herbs with the jam; they can discolor.